We are a full-service veterinary hospital, with in-house lab and diagnostics. 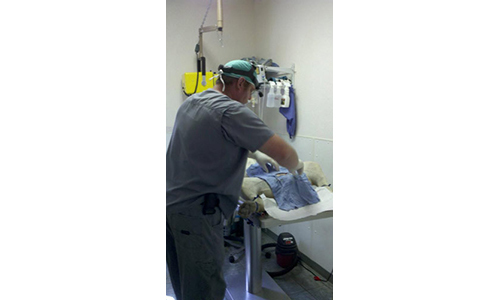 The clinic is equipped with a hydraulic chute and pens for safety and ease of handling large animals. We have pens outside for drop-offs and room for you to drop your trailer. Our practice includes farm animals (cattle, sheep, goats, hogs and horses), as well as dogs and cats. 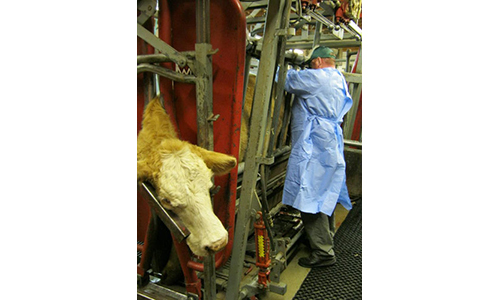 In-house lab and diagnostics, including Bovine Blood Pregnancy Testing and many more in house, allowing faster diagnostics and better treatment plans. We are excited to add services of Stem Cell Therapy and Platelet Rich Plasma Therapy to our clinic. These therapies give us an alternative to major surgery and allow an animal to be more active without pain. Platelet Rich Plasma (PRP) is where we draw a blood sample and harvest the PRP in our lab in the clinic. PRP has the ability to stimulate regrowth of tissue and anti-inflammatory actions. Stem cells are obtained by removing about 10-12 cc’s of fat from the animal. We then take the fat to our lab in the clinic to harvest and concentrate the stem cells. I like to re-suspend the stem cells in the PRP and then inject them into the affected area. This gives us the best of both worlds. The regenerative power of stem cells and PRP. Regenerative medicine is very exciting. We have already done 27 cases. Our success rate has been fantastic, with over 90% meeting owners expectations. The goal is to get the animal out of pain without having to use pain medication or in some instances the least amount as possible. A few of the cases I have seen have had too much damage, but we are still keeping them going with very little medication after the procedure. To me, any benefit is a success without the stress of major surgery. We have also inlisted the help of John Brochu to increase our service to the equine dental world. Mr. Brochu has floated over 50,000 horses in his career. Between Dr. O’Neill and Mr. Brochu, what you would normally have to go to a University for can now be done right here in NW Arkansas at Country Veterinary Service. The cranial cruciate ligament (CCL) is an impportant stabilizing structure in the knees (stifles) of dogs and cats. The CCL normally sits within the knee and is instrumental in assisting with articulation between the bones of the knee joint. During normal function, the CCL prevents abnormal movement of the bones. Injury to the CCL is common in dogs and results in abnormal laxity within the joint. Loss of stability of the knee leads to damage of the structures within the knee and irreversible osteoarthritis. A thorough examination and history is important to the diagnosis. Manipulations characteristic of knee instability are done and help with diagnosis. Although the manipulations are not always painful to your pet, sedation provides relaxation and allows more thorough examination. X-rays will not show torn ligaments, but they are taken to support the diagnosis and establish changes within the knee (such as fluid within the knee and osteoarthritis). The goals of treatment of CCL injury are to provide stability in the knee. This stability is designed to relieve pain, restore function and slow down the formation of osteoarthritis. Numerous surgical procedures have been shown to be superior. Non surgical options have been described, but are often difficult to control and can have a disappointing result in active dogs. Though no one procedure is found to be superior, the prognosis for return to function and prevention of further damage is best attained with surgical stabilization of the knee. At Country Veterinary Service we use a Swivelock Knotless technique. This is where we go into the joint and inspect the entire joint. Any damage is assessed and an attempt is made to clear up and clean the joint. If we have a lot of osteoarthritis in the joint we can also do a stem cell procedure at the same time. Normally this decision is made during the surgery after inspection. Then the joint is closed. Holes are drilled at biomechanical points to match the function of the cruciate ligament. A prosthetic similar to Kevlar with stainless steel is implanted using a vented Peek SwiveLock Suture Anchor. This incredibly strong prosthetic material has been used with great succes in human joint stabilizing procedures and provides the temporary stabilization necessary for scar tissue formation and long-term stability and function. It is important to follow a post-op plan. It will include restricted kennel rest and controlled muscle building activities (i.e., leash walking) for eight weeks post-op. We have a complete program for you to follow slowly increasing activity and rebuilding the ligaments, tendons and muscles as close to normal function as possible. A luxating patella is where the knee cap is not staying in the groove that it runs in on the femur (thigh bone). This is painful to your pet. Normally it will slip in and out and can cause osteoarthritis. At times it will slip out and not be able to get back in. If this happens your dog will be 3 legged and not able to use the leg. A thorough examination and history are needed for proper diagnosis. Manipulations of the legs are done to facilitate diagnosis, however sedation and X-rays help to confirm the diagnosis and assess the damage from the condition to the knee joint. The amount of damage to the knee joint can be directly related to how long and how bad the knee cap dislocating is. At Country Veterinary Service we use a Patellar Sling procedure with a Swivelock Anchor. This is all extracapsular and will keep the patella in place. A Kevlar with stainles steel sling is implanted to keep the knee cap running in the proper groove on the femur. If it is assessed that we have osteoarthritis we will also do a stem cell procedure at the same time. This sling offers a lot of stability to the knee cap. It is important to follow a post-op plan. It will include restricted kennel and controlled muscle building activities (i.e., leash walking) for eight weeks post-op. We have a complete program for you to follow slowly increasing activity and rebuilding the ligaments, tendons and muscles as close to normal function as possible.